Find out if our services are right for you! Call today at (310) 375-4325 to reserve your free consultation. Dr Vinick specializes in chronic, difficult to treat conditions: chronic pain, headaches, neck pain, back pain, low back pain, fibromyalgia, auto-immune conditions, and other chronic health problems. Dr. Mark L. Vinick is both a Chiropractor and Holistic Doctor (Clinical Ayurvedic Specialist) in private practice in Redondo Beach, CA. He has successfully treated a wide variety of conditions based on his extensive knowledge of both modern and ancient healing sciences. He incorporates the best of numerous healing modalities: Chiropractic (traditional and non-force), Ayurvedic Medicine, Energy Healing (Shakti Energy Healing), Nutrition, Homeopathy, Marma Therapy, Anti-aging, Stress Reduction Techniques, and Meditation. He is also one of the few chiropractors in Southern California who is board certified in drug-free Pain Management. Dr. Vinick is a life-long practitioner of yoga and meditation, and was a pioneer in teaching meditation in an educational setting long before it gained its recent popularity. He has also studied the alternative, nutritional, herbal, energetic, and spiritual approaches to health and healing for almost 40 years. He is Board Certified in three multidisciplinary specialties: Pain Management, Anti-aging Medicine, and Ayurvedic Medicine. He is certified with the Association of Ayurvedic Professionals of North America (AAPNA) at their highest level of training, as an Ayurvedic Doctor, Registered Ayurvedic Specialist (RAS). He is a long time student of the renowned Ayurvedic Physician, Educator, and award winning Product Formulator, Dr Rama Kant Mishra, and is acknowledged as a leading Practitioner of SVA Ayurveda. He served as President of The California Association of Ayurvedic Medicine for three terms and as a Director for eight years. He currently serves on the Editorial Board of the Light on Ayurveda Journal. He has had numerous articles published, has been interviewed extensively, and has appeared on radio and television interviews. He is a speaker, workshop leader, and consultant to several nutritional and health related corporations. 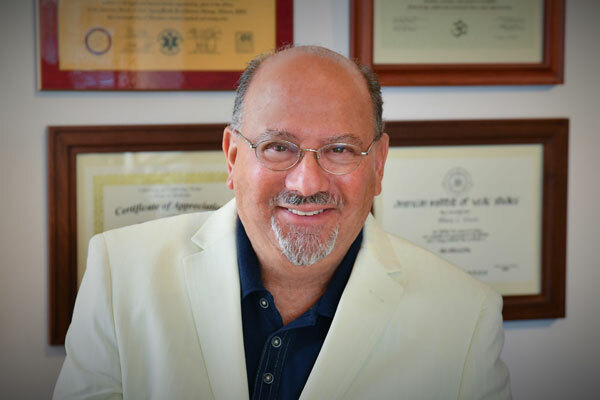 Dr. Vinick serves many patients in Redondo Beach, Hermosa Beach, Torrance, and the Greater Southern California area. He is one of the top Ayurvedic Specialists in Los Angeles County.